Happy New Year to all of our patrons. The library will be closed New Year’s Day- January1, 2018, and re-open on Tuesday, January 2, at 10:00 AM. It’s our last book bundle drawing of the year! Come on in from now until December 21 to enter. You may enter more than once, and for as many bundles as you wish! Winners will be drawn and notified on the 21st. Even if you don’t read enter anyway, books make great Christmas books! 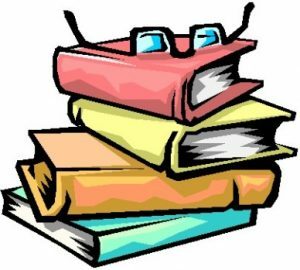 At the same time, we will be having a special drawing for a bundle of books donated by the Literacy Volunteers of Wayne County. There are various books in the bundle, and a cute stuffed animal. Stop in to see what they are all about, and to enter the drawing for that. One entry per person please. Due to the weather, the Rose Free Library will be closed today. We will open tomorrow at 10:00 AM. Stop in the library from now until Wednesday, November 22, to enter our Thanksgiving Book Bundle Drawing! We have 11 different bundles from kids to adults, fiction and non fiction. May enter more than once, names will be drawn on Monday, Nov. 27th. Kids, read down your fines! Come into the library and read any book at your age appropriate level, for 1 hour and we will take $1.00 off your fines. There is no limit to hours read, but you must read for a minimum of 1 hour at a time. Zinio for Magazines is now RBdigital! Be sure to download the app for RBdigital, for free magazines, and audio books to read on electronic devices. It’s easy to install, and easy to use! We are Open as usual! Beginning Wednesday, August 16th, there will be construction and landscaping going on at the library’s front entrance. We are still open. Please use the side ramp entrance. The book drop is located at the back of the building, to the left of the ramp. Thank you for your patience. 1000 Books Before Kindergarten Kickoff! Come and join us on Wednesday, August 16, at 6:30 pm for our kickoff event, for our 1000 Books Before Kindergarten Program! We will be joined by Mini Ark Farm. Real farm and exotic animals, light refreshments, everyone welcome! This program is tailored for children from birth to Kindergarten, with log books, special prizes for goals met, and a board in the library for each child to place his/her name when goals are met. Children may sign up from Birth through preschool. Please spread the word to families who may be interested. 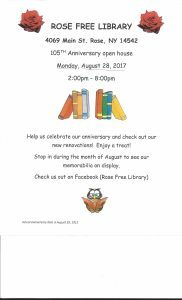 This program is made possible by an Early Literacy Grant from the Pioneer Library System. This is our final week of programs at the library. Coming up tomorrow, July 26, at 6:30 pm we have a Scavenger Hunt going on, and Thursday July 27, is our Craft at the Library day, come on in and build an owl! You can also take part in our ongoing Harry Potter trivia challenge which runs until August 5.